ENTERPRISE MANAGEMENT ASSOCIATES (EMAT) research shows 75% of CIOs are facing budget cuts. Most CIOs need to go beyond obvious cost reduction measures to address the largest single IT cost - staff. This paper, from industry analyst firm Enterprise Management Associates, explores how workload automation can help IT reduce outages, consolidate vendors, improve integration, and cut costs. Learn more. 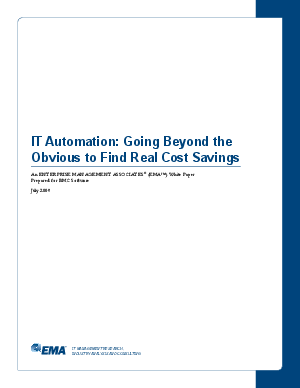 Download the white paper, "IT Automation: Going Beyond the Obvious to Find Real Cost Savings."